ONLY for use with old systems that can output a 15KHz (TV frequency) display such as Acorn A310, A410, A3000 etc. 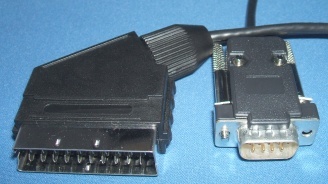 Inputs to a TV or Scart input monitor. On RISC OS modes 0 to 17 + a few extra are supported but not modes 20,21,27,28 or 31. NB. Not suitable for later Acorn/Archimedes computers such as A3020 which have a 15pin connector, for which we sell a suitable 15pin to SCART cable. NOT SUITABLE for most modern computers as they can't normally output a 15KHz screen mode @50Hz and a resolution of 640(576)x 256 (512 if interlaced).